As San Francisco, California, and Arlington, Texas, ready themselves for the 2010 World Series, fans are wondering about things like who’s going to play third for the Giants (Fontenot? Uribe? Panda?) and who will be in the outfield for the Rangers (Guerrero? Murphy?). We’ve also had starting lineups on the brain, as in the the Starting Nine vintage-baseball-memorabilia items for each team. Since the Giants have home-field advantage, the Rangers will bat first. 1. Leading off for Texas is a jersey worn by Frank Howard, who only played one year for the Rangers but spent 11 seasons (1961-1971) with the Washington Senators, the team’s predecessor. A Howard jersey from his Senators years would be a prize catch since collectors love items from teams that no longer exist. 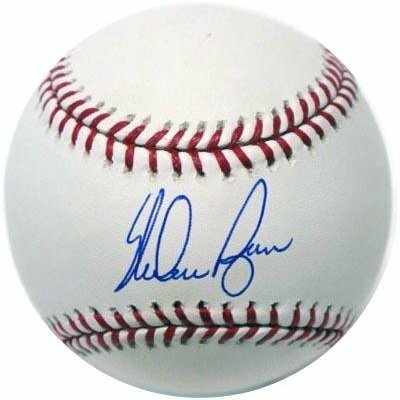 A baseball signed by Nolan Ryan is a must-have for any serious Texas Rangers collector. 2. Batting second, a Texas Rangers bobblehead from 1974. Before the Rangers’ mascot was a polyester palomino, it was chubby-cheeked plastic nodder made by Lego Japan. 3. In the number-three spot is a signed glove used by Rafael Palmiero, who had some of his best years in the majors with the Rangers (1989-1993, 1999-2003), including 1999, when he was selected as the designated hitter of the American League’s All Star team, fielded well enough to earn a Gold Glove, and was his league’s MVP and both league’s Player of the Year. 4. 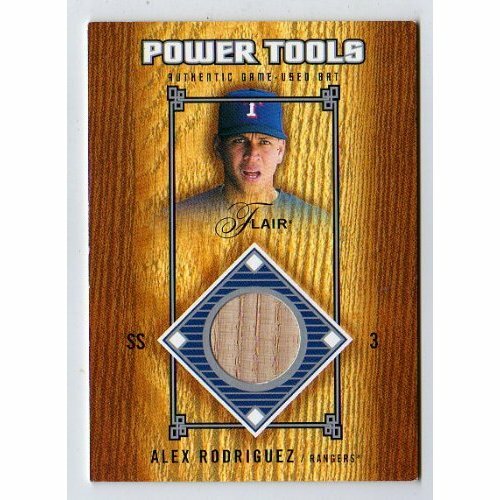 Hitting cleanup is a game-used bat from Alex Rodriguez, who smashed 156 homers in Rangers Ballpark back when it was called The Ballpark at Arlington but before it was renamed Ameriquest Field—that naming-rights deal lasted only three years. A signed Rodriguez bat from 2001-2003 would be pretty darned cool. A Texas Rangers bobblehead from 1972. 5. Batting fifth is a signed batting helmet from Juan Gonzalez, who was the American League’s most valuable player twice and prowled the outfield for the Rangers for 13 of his 17 seasons. 6. Hitting sixth is a pair of baseball cards from another former Senator, Jeff Burroughs, who is one of the few players to be both a first-round draft pick (Washington Senators, 1970) and win a league MVP (Texas Rangers, 1974). Frame his rookie card next to the one honoring his MVP. 7. In the number-seven spot is a Senators program from R.F.K. Stadium in Washington, DC, which is where the once-and-future Rangers toiled before settling into the much friendlier confines of Rangers Ballpark. Alex Rodriguez hit 156 homers with the Rangers. 8. Rounding out the lineup, batting eighth, is a pennant from 1999, when the late Johnny Oates led his Rangers to their third AL Western Division title in four years. Ironically, the Rangers didn’t win the pennant (as in the American League championship) that year, so having a pennant (as in a triangular piece of cloth) would be the next best thing. 9. And last but definitely not least, is an autographed baseball by pitcher Nolan Ryan. Though he only spent five of his 27 years in the majors with the Rangers, they were the last five, and he threw two no-hitters and was the league’s strikeout champion twice when he wore a Rangers uniform. Today, he owns the team. A souvenir from the last time the Giants won a World Series. 1. 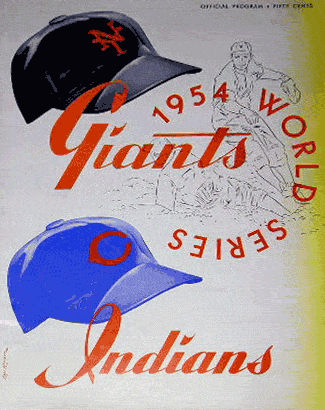 Leading off is a program from the 1954 World Series, the last time a baseball team called the Giants won a World Series (they did it as New Yorkers). 2. 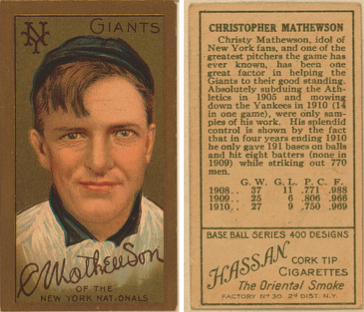 Batting second is an even older treasure, a tobacco card bearing an illustration of Christy Mathewson, who played all but one game of his 17-year career with the New York Giants. Mathewson had four 30-win seasons—one year he won a staggering 37 games and posted an ERA of just 1.43, which wasn’t even his career best. 3. In the number-three spot is a signed mitt by 12-time Gold Glove winner Willie Mays, who patrolled center field for 20 seasons with the Giants. Mays played his last two years with the New York Mets, but most San Franciscans forgave him for wanting to take a curtain call in the town where his career started. Only the hardiest fans got these free pins. 4. Batting cleanup, as he did for the Giants, is a signed bat by Willie McCovey. Though he did not hit as many home runs as Mays (521 vs. 660) or Barry Bonds (762), the body of water behind AT&T Park, into which the very best sluggers in the league occasionally hit home runs, is named McCovey Cove. 5. In the fifth spot is a pair of game-worn batting gloves once owned by the aforementioned Barry Bonds. 6. Batting sixth is a pennant from 1958 or 1959, the two years the Giants played at Seals Stadium before they moved into Candlestick Park. 7. Hitting in the number-seven position is an autographed photograph of Bobby Thomson, who connected with the famous “Shot Heard ’Round the World,” a home run in 1951 to give the New York Giants the National League pennant. Christy Mathewson was one of the first five players inducted into the Hall of Fame. 8. Rounding out the lineup is a Croix de Candlestick pin, which was awarded to those fans loyal enough to tough it out to the end of an extra-innings night game at Candlestick Park, one of the coldest and windiest spots in the San Francisco Bay Area. The pin features the Giants logo on its face—the tops of the letters “S” and “F” appear to be dusted with snow. 9. Batting last, in the pitcher’s spot, is a baseball signed by Juan Marichal, whose half-dozen 20-win seasons in the 1960s made him one of the decade’s most dominant hurlers. No doubt his high-kick windup and delivery had an intimidating impact on hitters, too. “ ” Proper ladies didn’t have a lot to do in those days.